Deafness is defined as an impairment of hearing ability, which may be partial or total. Deafness is seen in old people but certain diseases may result in deafness at a younger age. This is an important cause of disability in older people and adds to their discomfort during day to day activities. It affects all forms of social interaction and may even become a stigma. The sound waves are directed towards external auditory canal due to the shape of external ear or the pinna. These waves vibrate the tympanic membrane which transmits the sound to the middle ear. There are three small bones in the middle ear known as malleus, incus and stapes. These bones conduct the sound from the tympanic membrane to the inner ear which has special receptors connected directly with the vestibule-cochlear nerve. This nerve transmits the sound to brain where it is deciphered and understood. Based on this description, deafness is also classified as conductive or sensorineural deafness. Conductive deafness: When the eardrum or the middle ear including the three little bones is diseased, the sound transmission to the inner ear or the cochlea is affected. This is defined as conductive hearing loss. Sensorineural deafness: Diseases involving inner ear and vestibule-cochlear nerve result in sensorineural deafness. There are many different causes of deafness which may affect one or both ears. There are many different causes of deafness which may affect one or both ears. These causes are related to age, exposure to noise, chemicals, direct injury and as complication of other illnesses. Based on the knowledge of its cause, the hearing loss can be prevented and treated. Age related hearing loss is called Presbyacusis. 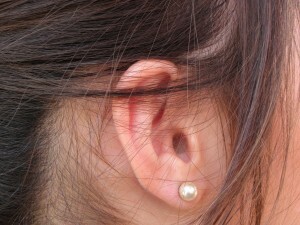 In this condition, both ears are affected equally. Audiometry shows that the loss is mainly at high frequencies. Other causes should be excluded before arriving at this diagnosis. This occurs due to degenerative changes in the cochlea. Hypertension has been found to be associated with vascular changes which cause reduction of blood supply to cochlea. They aggravate age related hearing loss. Atherosclerosis results in narrowing of blood vessels due to deposition of lipids. This may result in reduction of blood supply to the cochlea. Since cochlea is very sensitive, a reduction in oxygen delivery affects its performance and results in deafness. A diet high in saturated fats may acts as fuel to the fire in the pathogenesis of atherosclerosis. Smoking or consumption of tobacco in any form is also a risk factor for atherosclerosis and contributes to the occurrence or aggravation of deafness. Diabetes is an independent risk factor for atherosclerosis. It is also associated with vasculitis and calcium deposition in the wall of blood vessels. These changes may result in reduction in the blood supply to cochlea. Diabetes causes neuropathy due to changes in metabolism of nerves. This neuropathy affects the vestibulocochlear nerve. This multipronged damage caused by diabetes results in deafness. Exposure to loud noise over a period of time results in noise induced hearing loss. If one listens to loud music, the risk of deafness increases. It is also the cause of occupational deafness seen in factory workers who are exposed to loud noise. It is a preventable condition, and so the workers in such situations are asked to wear ear defenders which cover the ears and reduce the volume of noise. One time exposure to very loud noise may also result in deafness. This may occur after a loud explosion, firecrackers or gunfire. A rupture of the ear drum of dislocation of the middle ear bones is the cause of deafness in such situations. Drug induced deafness is a known entity. Many drugs are ototoxic and cause temporary or permanent damage to inner ear. Some of the common ototoxic drugs are gentamicin, tobramycin, cisplatin (used for treatment of cancer) and aspirin. Deafness is a disability which can affect all age groups. It requires complete assessment for treatment and further progression. In occupational hearing loss preventive measures are taken. In many countries they are legally compulsory. Hearing is an important function for daily living and every effort should be taken to preserve it. ← Longevity and fitness – is there a correlation?